Most people know veterinarians are doctors for animals, but don’t know what education and background is required. The average veterinarian completes 4 1/2 years of undergraduate education, taking classes such as biology, chemistry, organic chemistry, biochemistry, physics, microbiology, anatomy and physiology, math, animal science, and more...and that's just to prepare them for veterinary school. Some veterinarians already have a Master's degree or PhD before they enter veterinary school. Others may enter a dual DVM/MS or DVM/PhD program, and some go on after veterinary school to get additional degrees and/or specialty training. In veterinary school, the 4-year education is equal to what medical school students receive – but for many more species instead of just one. Course subjects include anatomy, physiology, pharmacology, microbiology, immunology, pathology, toxicology, biochemistry, surgical techniques, and many more, as well as in-depth courses on specific animal species and body systems. The early years are mostly spent in the classroom and laboratory to prepare the students for client-owned animal patients. Veterinary students get additional education and experience during clinical rotations, seeing animal patients under the close supervision of experienced mentors. Once they graduate from a U.S. veterinary school, they receive a Doctor of Veterinary Medicine (DVM) or Veterinary Medical Doctor (VMD) degree (the degrees are different in other countries). They are now veterinarians and are qualified to perform the duties of the profession. A number of veterinarians also seek additional training in the form of an internship (usually one year) and/or residency (approximately 2-3 years) and may become board certified in a specialty area. In order to practice veterinary medicine on animal patients, they must be licensed in each state in which they practice. State licensure requires a veterinarian to pass a national examination that tests their veterinary knowledge. Some states also require a veterinarian to pass a state-specific examination, most often to test their knowledge of the state's laws and regulations governing veterinary medicine. In order to maintain their state veterinary license, veterinarians must obtain continuing education. 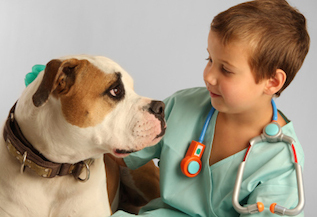 Besides learning about medicine and having a love of science and math, veterinarians must also have the technical ability to use all types of medical equipment and instruments, as well as computers. They must be creative since their patients can’t tell them how they feel, and often the answers lie beyond the medical books. They must communicate well with people, both pet-owners and co-workers, and be able to work with a team during the stress of emergencies and patients who are not always willing to be in a veterinary hospital. It takes a very special person to become a veterinarian, and it can be difficult to get accepted into veterinary school, even for the best students. However, despite the difficulties, most veterinarians will tell you it is the most rewarding job on earth and most of them have wanted to be one since childhood. If your child has this kind of desire, he/she will need encouragement, stamina, and excellent grades, but will love going to work every day.